Do you have questions about a possible Nursing Home Abuse and Neglect case? Contact us now using this confidential form. We'll help you get answers. We are Ohio nursing home abuse lawyers. We investigate nursing home abuse, injuries, and suspicious deaths for families. We get answers about what happened, and why. When appropriate, we can file a nursing home abuse or neglect lawsuit, and try a nursing home case to a jury. We empower families to hold nursing homes accountable for their carelessness. When Is a Nursing Home Responsible for Elder Abuse or Neglect? What Can We Do to Change Nursing Home Conduct? What Can Lead to Nursing Home Injuries? Why is Nursing Home Abuse So Common? How do I Hire You to be my Nursing Home Abuse and Neglect Lawyer? Nothing is more difficult that trusting vulnerable family members to someone else’s care. When a nursing home corporation violates that trust by carelessly injuring, abusing, or neglecting your parent or family member, the corporation–or its insurance company–will hire lawyers to do everything they can to keep the nursing home from being held accountable. That’s where we come in. We balance the scales by bringing deep experience in nursing home trial work to cases involving nursing home abuse, nursing home neglect, falls in nursing homes, bedsores, and nursing home wrongful death, among others. Every person’s story is different. But everyone wants to know what happened, and if someone is to blame. We’ve developed a system for investigating nursing home cases, building the case, and working the case up for trial. If we determine there is a strong case, we’ll take it on, and take it to the end. You’ll get answers. The nursing home will either take responsibility, or we’ll force them to trial to be held accountable by a jury. prepare you and your family to be confident at trial. On our nursing home lawsuits page. If a nursing home violates federal regulations, Ohio regulations or the Ohio Resident’s Rights Law, its own policies, or reasonable industry standards, it may be liable for injuries that result. We concentrate our practice on investigating and proving these types of violations, to be able to prove nursing home negligence at trial. Often that means nursing homes want to settle, because they know from experience or reputation that we’re ready and able to take them to trial. Nursing Homes are corporations: they speak the language of money. Corporations, even non-profit corporations, are not real people; they do not have hearts, minds, souls. In our experience, holding a nursing home responsible and accountable for carelessly injuring residents through a money verdict at trial, or a settlement motivated by their fear of trial, is the best way to make sure there is change. Money damages available in a nursing home abuse lawsuit can involve economic costs (medical bills, etc. ), emotional harms like pain and suffering, disfigurement, disability, and, if the injuries cause death, the mental anguish and loss of family members for wrongful death. 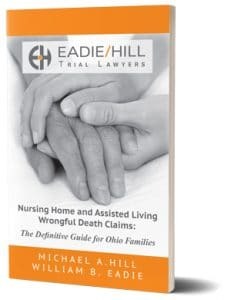 Ohio allows for punitive damages when a nursing home consciously disregards a resident’s rights and safety with a great probability of causing substantial harm. They are awarded in exceptional cases. We’ve proven punitive damages at trial, including a $3,000,000 verdict for punitive damages against one of the largest nursing home companies in America. Punitive damages are intended to punish, deter the defendant from doing the same thing in the future, and reform the nursing home industry. Nursing home injuries can be caused by systemic failures. Whether it is a fall, bedsore, dehydration, or other injury, the root cause can often be something else entirely. Experienced and savvy nursing home lawyers will know to investigate the root causes of the injury. When a nursing home does not make sure there are sufficient direct-care staff to ensure adequate and timely care for every resident, injuries are going to happen eventually. Nursing Homes are liable for understaffing that leads to resident injuries. We obtain the records—time sheets, schedules, pay rates, resident count, resident care need data—to determine whether inadequate staffing is to blame for injuries. Often the care givers aren’t to blame: they are put in an impossible situation of too few staff members for resident needs. In those cases, you need a legal team experienced in showing the systemic, rather than individual, responsibility. Nursing homes must make sure their personnel are qualified, licensed, not violent or prone to abusing residents, and to train them to provide adequate care. If a nursing home hires or retains dangerous or incompetent employees, the nursing home can be held responsible in the case of abuse. Nursing homes can also be responsible for inadequate staff training leading to resident injury or death. Ohio nursing home residents are guaranteed certain rights Nursing home residents are entitled to autonomy, dignity, and privacy. A nursing home can be held liable if one of its employees violates these fundamental rights. Medications are a necessary part of growing older: most people over a certain age have medical issues requiring medication management. Nurses are the front line for medication administration, and errors are all too common. This can be caused by being given the wrong medication, the wrong dosage, too much, or too little medication. If a nursing home resident is injured or killed by a prescription drug medication error, the nursing home, physician, pharmacy, and / or pharmacist can be held accountable. Infections in nursing homes can come from unwashed hands, skin bacteria, open wounds, pneumonias, or unsanitary waste management. Nursing homes must take steps to prevent and control infections. That means ensuring protocols regarding sanitary conditions are in place and being followed. And when an infection occurs, proper steps are taken to alert staff and family to prevent infection from spreading. We’ve investigated nursing home cases where the state authority has cited nursing staff at the facility for failing to maintain infection controls when changing dressings, leading to the risk of infection. An experienced nursing home trial lawyer will know to check for regulatory inspections, infection incident reports, and other information to evaluate whether a specific infection could have been caused by poor infection controls. A nursing home can have all the right policies, but if it does not monitor staff performance it has no idea whether resident’s are receiving adequate care. Nursing homes need to have systems to have nurses monitor aides (nursing assistants or STNAs), and nurse managers monitor nurses. Because of the shame or fear that can be involved in abusive situations, family members should be watchful for signs of abuse, and encourage them to share in private. You can also seek legal counsel if you believe that abuse may be occurring or have already occurred. Learn more about nursing home abuse. If you suspect your loved one is being abused or neglected by a nursing home, contact us to discuss what we can do to help. Consultations are always free and confidential. There is a short time limit in Ohio for medical claims, so do not delay. Call us at 216-777-8856 of fill out the investigation form. According the Centers for Disease Control and Prevention, more than 1.4 million elderly individuals reside full-time in more than 15,000 nursing homes across the United States. More than 12 million people will need long-term care during any given year. According to the most recent statistics, more than 2 million cases of elder abuse are reported each year and almost 1 out of every 10 elderly individuals will experience some form of elder abuse in their lifetime. Understaffing is a leading problem in nursing homes. In an effort to reduce labor costs and increase profitability, nursing homes frequently staff below optimal levels resulting in delays in care or residents receiving less than the amount of care that has been ordered by a doctor. In addition to nursing homes being understaffed, nursing home workers are often under-trained and required to perform tasks they are not competent to perform. Data suggests that many nursing home workers feel they are overworked and underpaid. Studies have shown that this viewpoint can lead to negligence, frustration, and sometimes abuse.